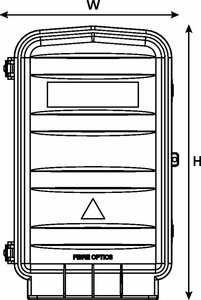 Technical Description The Fibre Facade Enclosure (FFE) is manufactured from UV stable black polycarbonate with a completely detachable lid which can also be snapped back in to position using the snap back hinges allowing unrestricted access to all fibre management areas. 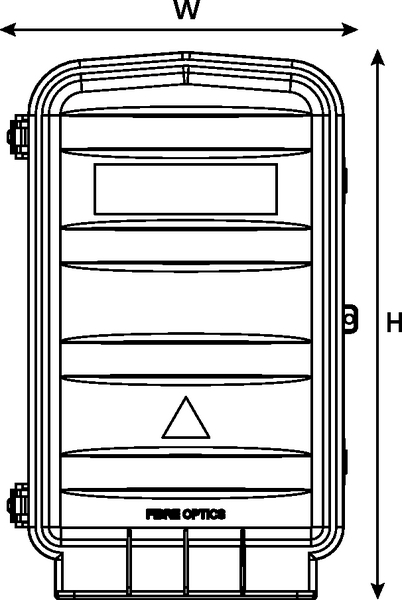 The enclosure has 3 separate management areas for inbound cable, fibre splice management and drop cable (customer connection) management. 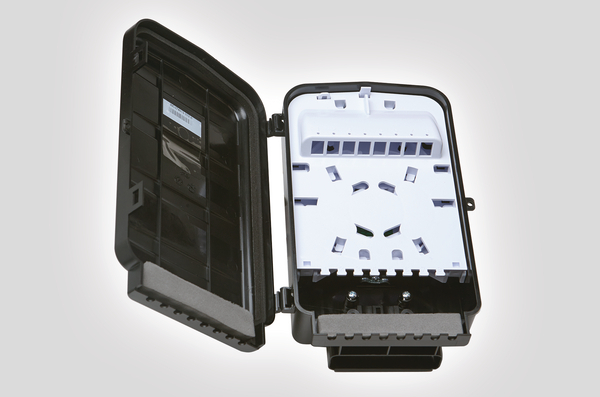 The inbound cable management area has a dedicated cable entry port which supports both cable end and mid-span applications with loop storage capacity for up to 1.5m* of excess fibre and the entry port is sealed with a cable entry kit (cable diameter 7mm - 10mm) to maintain the IP55 rating. 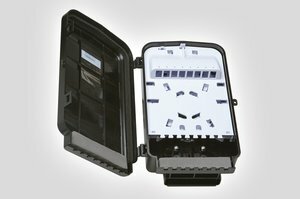 The fibre splice management area has capacity for a maximum of 12 x 3A or 24 ANT splices and maintains positive fibre management (30mm minimum bend radius) throughout.The tray has a crossover facility which allows for alternative routing requirements and a fibre storage capacity of 1.5m for 250µm fibre and 1.0m of 900µm fibre.The drop cable management area presents either 8 LC Simplex adaptors for connection to industry standard pre-terminated drop cables and a PLC splitter (60mm x 7mm x 4mm) can be fitted on the inside of the management area.The drop cable management area cover prevents access to the network cables and splicing area and the adaptors are angled and spaced to allow for inspection prior to connection. Eight anchor guides are provided for securing the drop cables (maximum diameter 6.0mm) and an integral seal maintains the IP55 rating.